Knowing how much of your scene you can capture at each lens' focal length is a conundrum every photographer has come up against. 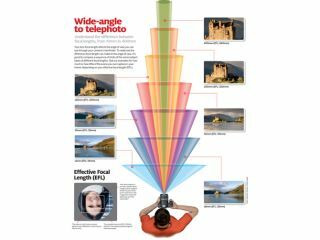 In our earlier post earlier answering the question, 'What is Focal Length?,' we looked at some of the differences and capabilities of using a telephoto vs wide-angle lens. A wide-angle lens exaggerates perspective, while using a telephoto lens gives the effect of compressing perspective, bringing elements closer together in the frame. In the latest of our ongoing photography cheat sheet series we aimed to illustrate some of the differences a different lens focal length can have both in terms of how your image looks and how much of your scene your camera is able to include. In our infographic below you can see just how much of a scene your camera can capture at different focal lengths starting from an ultra-wide 10mm all the way up to 400mm. To see the larger version of this photography cheat sheet simply click on the image below, or drag and drop it on to your desktop.